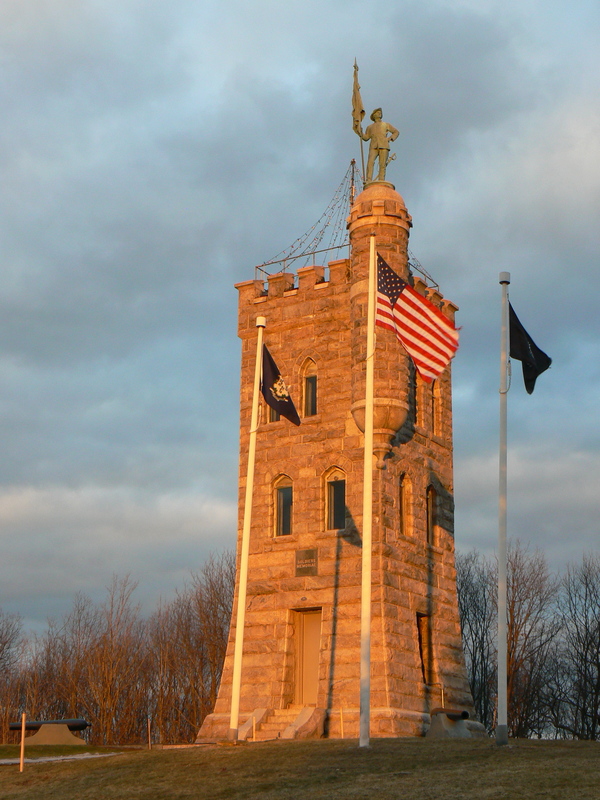 Winchester honors its Civil War veterans with a magnificent 64-foot medieval tower on a hill overlooking the town. The Winchester Soldiers’ Monument, dedicated in 1890, is the largest feature in a Crown Street park. The monument features a corner tower topped by an eight-foot bronze standard-bearer. 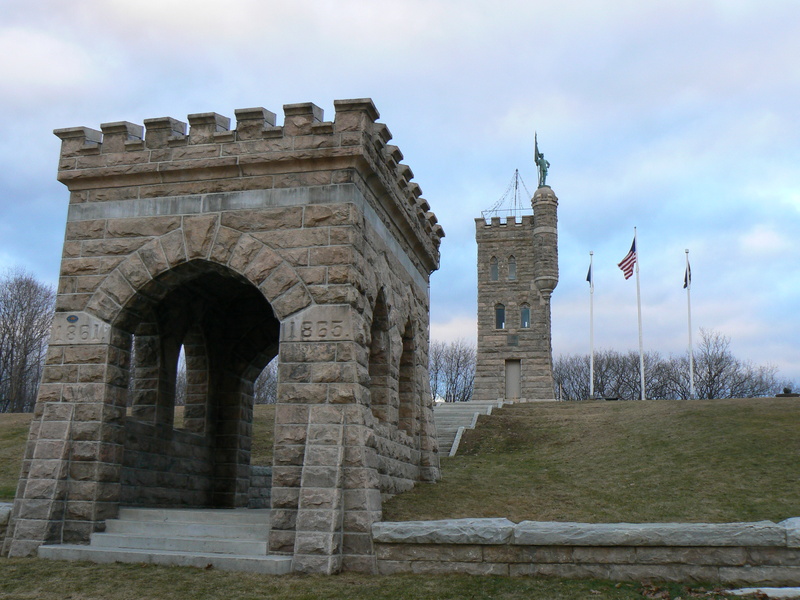 A granite archway along Crown Street, in the Winsted section of Winchester, stands in front of a long stairway that leads visitors to the monument tower. The archway bears the years of the Civil War. A marker on the front (west) face of the monument reads “Soldiers Memorial.” Below the marker, a small plaque honors the monument’s inclusion on the National Register of Historic Places. The monument’s interior also includes markers listing the approximately 300 local residents who served in the war. The interior also includes a fireplace. A bronze door that depicted scenes from the war was lost to a World War II scrap drive. During World War II, the monument was used as an observation tower. A wooden structure was added to the roof, and the site was electrified. The tower is also used to display Christmas lights, which were visible atop the monument during our visit in late January. The park surrounding the monument also includes two cannons, a fountain/planter and a bulletin board with helpful information describing the monument and its history. The monument was designed by architect Robert W. Hill, who was also responsible for several state armories, opera houses in New Britain and Thomaston, the Litchfield county courthouse, and other public and private buildings. 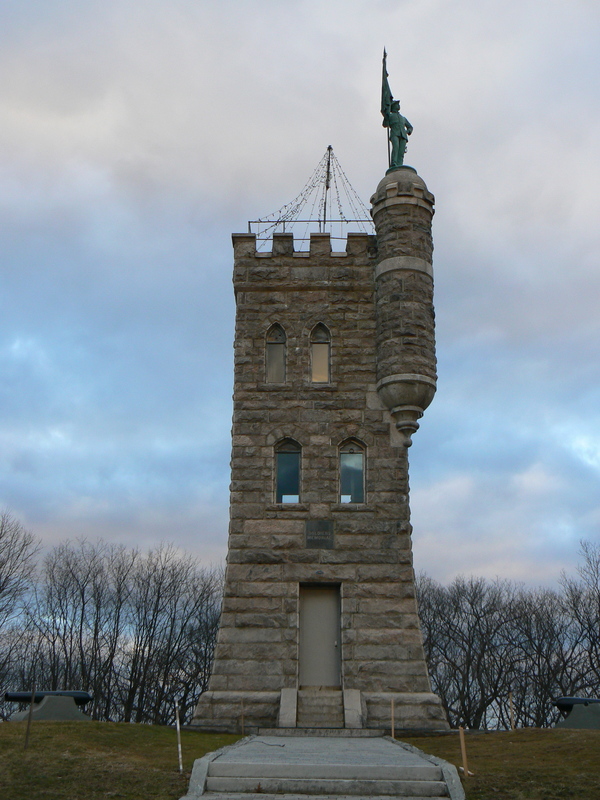 The standard-bearer was created by George E. Bissell, whose other creations included the Soldiers’ Monument in Waterbury, and the Civil War Monument in Salisbury. The Winchester monument was been repaired several times in its history. Broken windows were replaced in the late 1970s, and since the early 1990s, a municipal commission has overseen the ongoing restoration of the monument.